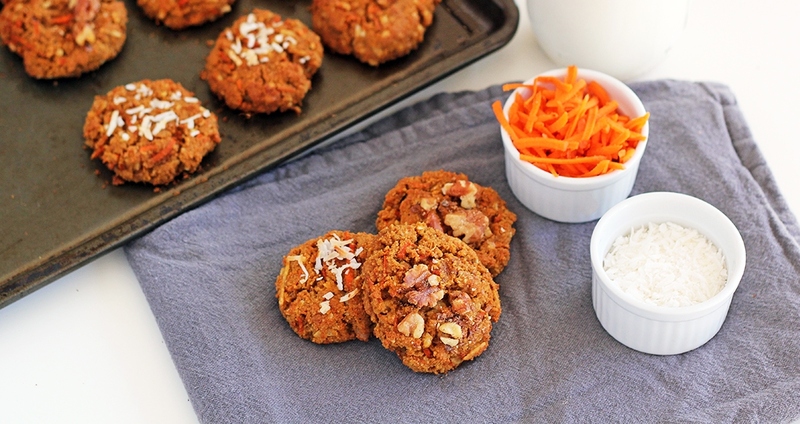 These cookies are the perfect way to satisfy a carrot-cake craving! Loaded with freshly grated carrots, shredded coconut, walnuts and spices, these chewy and dense cookies are a wonderful dessert or afternoon snack. This recipe is also gluten-free, grain-free and dairy-free. In a large mixing bowl, add the eggs, vanilla extract and coconut oil. Mix well, then add in the remaining ingredients and mix until combined. Lightly grease a baking sheet using non-stick spray or a dab of coconut oil. Divide the dough into twelve balls and place onto the baking sheet. Slightly flatten the dough with your hand. Add additional walnuts or shredded coconut on top (optional). Bake for 15–17 minutes, or until the edges of the cookies are golden brown. Allow cookies to cool for at least 10 minutes prior to serving.